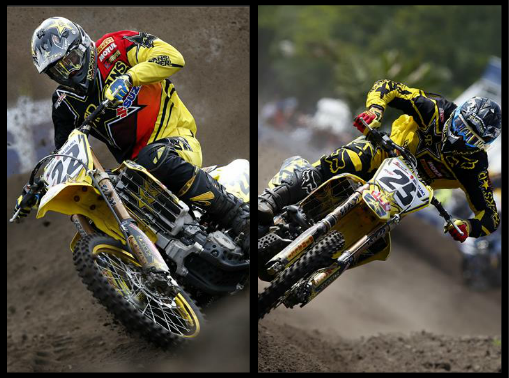 Team Suzuki Press Office – May 4. Hot Dutch sunshine shone down on the sand of Valkenswaard as Rockstar Energy Suzuki World MXGP’s Kevin Strijbos nudged team-mate Clement Desalle from the third-step of the podium in front of a decent 27,000 crowd for what was the sixth round of the FIM Motocross World Championship. The Grand Prix of Netherlands is almost a home event for the Lommel-based factory team. The Eurocircuit sand was dry, bumpy and tricky with some hard and slick sections but also vast berms and ruts by the time of the second motos on Sunday. The terrain required some refinement to the set-up after the first day of action and the team worked steadily to find the optimum configuration for both riders. Strijbos was a lonely sixth in the first moto but altered his RM-Z450 again before the second race and was a more proactive threat. The Belgian chased Jeremy Van Horebeek hard for second position and pushed his countryman down the order in the final two laps. Strijbos’ best result in 2014 allowed him to swap places with Desalle and secure his second trophy of the campaign. Desalle also rode effectively across the sand and at a circuit that has not usually been one of his strongest in past seasons. He pursued Evgeny Bobryshev in the first sprint and overtook the Russian with two laps remaining to score fourth place. In the second moto he was a lonely fourth again and ended the day with the same slot. Desalle is third in the MXGP table, six points behind Jeremy Van Horebeek. Strijbos is fifth and 23 behind Gautier Paulin, who crashed and broke his collarbone in the second moto. The team will head back to the workshop across the border and quickly re-stock before starting the long drive down to Talavera de la Reina, southwest of Madrid this week, for the first Grand Prix of Spain since 2011.